Years and years ago I was given a spaghetti squash, I think because the original recipient had no idea what to do with it… The internet was not so readily available back then (gosh that makes me feel old! ), and as I had no idea what to do with it either, I of course, made soup. It’s a soup I still remember now, as one of my all time favourites! I had so few ingredients but the flavours have stayed with me, It was simply the squash, onion, peas, vegetable stock and dried herbs. I’ve always assumed I’d try to recreate it some day, but do you know, I don’t think I will, I would hate to be disappointed! So when I saw spaghetti squash in the greengrocers this week I had to buy one, with the intention this time of making a salad. I had to add peas of course, and with roasted corn, lemon tarragon dressing and some immensely pretty local tomatoes it made a bright, fresh salad for the first day of autumn. 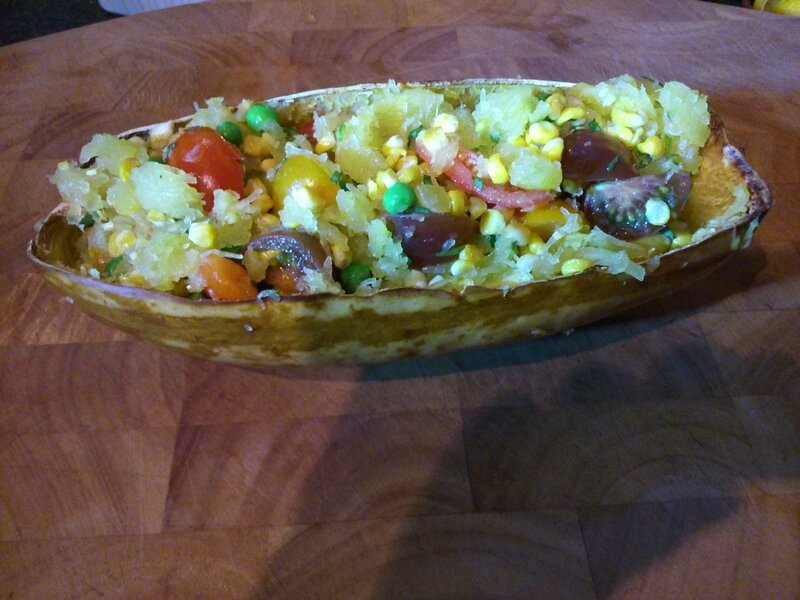 Spaghetti squash, tomato, corn and pea salad – served in the squash shell! To cook the spaghetti squash, first cut it in half and scoop out the seeds. Lay the squash pieces skin side down in a roasting tin and add 200 ml of hot water. Bake for 1 hour to 1 hour 30 until the squash is tender, adding a splash more water to the pan every half hour or so. Use a fork to pull the strands of squash from the skin and set it aside in a large bowl. When the squash is in the oven mix the lemon juice, zest, olive oil, and salt and pepper together well. Put the corn cobs in a small roasting tin and tip half of the dressing over the top. Roll the corn in the dressing and then roast for 30 minutes until tender and browned in places. Cool the corn a little and then strip the kernels from the cob. Add the corn, peas and tomatoes to the spaghetti squash, and toss with the rest of the dressing and the tarragon.